The local leaders making our region more vital, equitable and inclusive. Left to right: Bill Ruckelshaus, Bob Ferguson, Doris Koo, David Harris, Larry Gossett and Pat Graney. The newspapers called it the “Saturday Night Massacre.” It was 1973, and President Richard Nixon was consumed by scandal. Former White House aide Alexander Butterfield had just dropped a bombshell by testifying that Nixon had been secretly recording conversations in the Oval Office. Special prosecutor Archibald Cox demanded that Nixon turn over the tapes. Nixon, clearly aware of what those recordings would mean for his career, instead ordered Cox fired. Two of his top justice department staffers refused to carry out the order, and resigned in protest. Ruckelshaus, now 85 and a longtime Seattle-area resident, is among the winners of Crosscut’s 2017 Courage Awards, which recognize leaders in public service, business and culture—and for the first time, in tech and elected office. 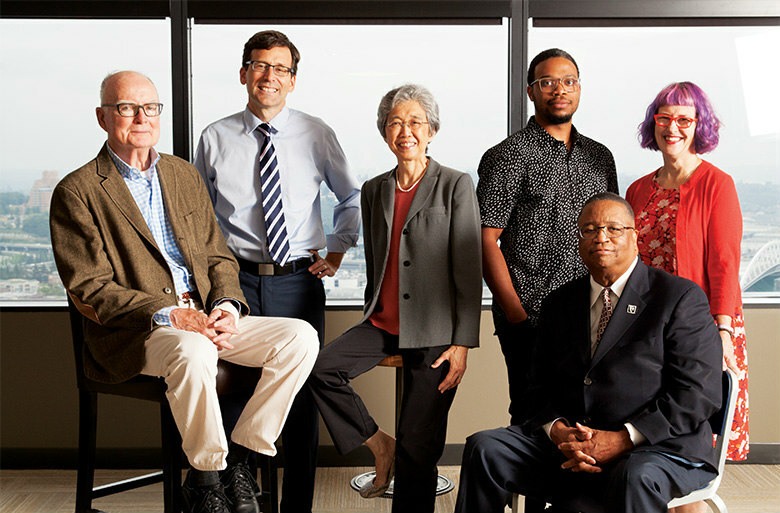 Seattle magazine is proud to partner with Crosscut in recognizing these local leaders whose personal and professional dedication is making our region more vital, equitable and inclusive. While perhaps best known for his role during Watergate, Bill Ruckelshaus has had a long and distinguished career. In 1970, he was the first administrator of the Environmental Protection Agency. There, he pushed for new federal pollution standards. He has served as U.S. envoy for the Pacific Salmon Treaty, chair of Washington state’s Puget Sound Partnership, and cochair of the Joint Ocean Commission Initiative and the Blue Ribbon Panel on Ocean Acidification. Today, Ruckelshaus is a strategic director with the Seattle-based venture capital firm Madrona Venture Group. His public service continues, and so does his passion for the environment. Ferguson, a former professional chess player, emerged into the public arena of law and politics with a strong penchant for defending the powerless against the powerful. Early in his career, he spent a formative summer advocating for the Yaqui Indians and for inmates on death row. Those experiences cemented the lesson that “not everybody starts on a level playing field,” Ferguson says. Ferguson made his debut in public office in 2003, winning a race against a 20-year incumbent Democrat on the King County Council. He secured his current position in 2012. Now, there’s chatter that he might run for governor; he is declining to comment for the time being, but it’s not difficult to imagine Ferguson running, and winning. Over a nation-spanning career, Koo has worked with banks, community organizations, developers, civil rights organizations and financiers, all to propagate more places to live for those most in need. Now, she is putting her years of diverse experience to work as lead consultant of the Yesler Community Collaborative, a nonprofit dedicated to creating a more affordable and diverse Seattle. Amid Seattle’s pressure-cooker real estate market, the collaborative has had to become creative. At the Central District’s MidTown Center, it brought together a for-profit developer, a land trust and a community group to create a development that will include more than 100 affordable units. In 2009, David Harris was feeling unfulfilled in his job at Microsoft, so he left and eventually went to work at Technology Access Foundation, a Federal Way–based nonprofit that works to improve access to science, technology, engineering and math for students of color and students from underrepresented communities. There, he collaborated with local companies and professionals to connect teachers and students of color to workshops, field trips, classes and internships. In 2014, Harris started Hack the CD, an annual hackathon designed to bring together the tech world, the startup community, downtown businesses and residents of the historically African-American Central District, where he lives. Over the past three years, dozens of budding entrepreneurs have pitched business ideas at the event, from tech to T-shirt companies. Many have been connected to investors that have helped them get off the ground. Today, as the startup advocate for the City of Seattle, Harris continues to connect the dots for many in the tech community. He helped Seattle to become designated as a TechHire community, part of a national initiative started by President Obama that seeks to open training and employment opportunities to underserved communities. Locally, the program targets women, people of color and formerly incarcerated individuals. Bob Santos, Roberto Maestas, Bernie Whitebear and Larry Gossett were four leaders from four different communities who challenged and changed white Seattle from the late 1960s through the 1990s by demanding equity and social justice for women and people of color. But what made them unique was their ability to work together. In 1972, Maestas led the takeover of the old Beacon Hill School, which became El Centro de la Raza, a nonprofit that provides community services for Seattle and King County’s Latino community. Santos won health care, low-income housing and child-care services for the Chinatown/International District. Whitebear led the Native American takeover of Fort Lawton, and eventually convinced the federal government to give the tribes 18 acres of land. Gossett led the Black Student Union at the University of Washington, and went on to become the executive director of the Central Area Motivation Program (now Centerstone), one of Seattle’s oldest anti-poverty agencies. Through it all, these men supported one another. “Our commitment was, let’s not fight for the crumbs against each other, let’s not have anybody pit us against each other,” Maestas recalled in 2009. In the long and decorated arc of her life, Seattle-based choreographer Pat Graney has danced through a labyrinth of forms, styles, language, literature and music that eventually landed her in prison—not as a prisoner, but as a teacher, orchestrating one of the nation’s longest-standing prison arts programs in correctional facilities in the country. Graney’s career began when she was a student at The Evergreen State College in Olympia, and it eventually brought her to Seattle, where she connected with the city’s dance luminaries. Among countless awards, she has received 11 consecutive choreography fellowships from the National Endowment for the Arts. In 2013, she was one of 20 Americans to receive the prestigious Doris Duke Performing Artist Award. In 1992, Graney started Keeping the Faith–The Prison Project, an arts-based residency designed for incarcerated women. The program includes dance, writing, visual arts and sign language, and culminates in a performance. Over the course of the residency, Graney says, participants are transformed. “There’s something very powerful about being able to witness another person’s choice to be open rather than closed, another person’s choice to write about difficult things and to be able to share that in front of an audience,” she says.